Oh my god it´s hot out here! Flew into Alice Springs which is literally in the middle of nowhere. Got a taxi into town which is basically a high street! We stayed at the Alice Motor Inn which was fine for the one night. In town there are a few bars, restaurants and a load of souvenir shops. For a night out would recommend Town and Country pub or Bojangles (www.boslivesaloon.com.au) for a more traditional saloon feel. Wayne tried camel for the first time and wasn´t impressed! Were picked up for our tour at the unreasonable hour of 6am! Picked up two more passengers Hank and Ineka from Holland, 61 years old. It would just be the four of us plus Chris (our guide) and Jean (our hostess) for the next 3 days. We began our journey to Kata Tguta which took about 6 hours with stops along the way and having to remove dead kangaroos from the road. Took a walk around the Kata Tguta (the Olgas) in the boiling sun. 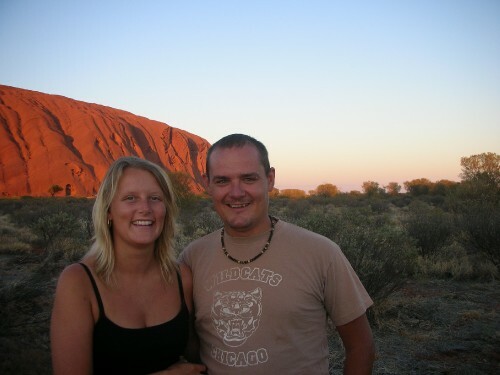 Then onto Uluru (Ayers Rock) to see the sunset with champagne and cheese and biscuits. Had dinner back at camp where 5 others joined us for the night. After a couple of glasses of wine it was straight to bed for our 4am start. Drove to a different spot by Uluru to watch the sunrise (no champagne though) and then we did the base walk around Uluru. We chose not to climb it, as it is offensive to the aboriginal people, it is a very sacred site to their religion. By the time we had finished the base walk, the climb had already been closed due to temperatures reaching over 36oC and that was at 9am! After lunch we drove to King´s Canyon where we spent the night and in the morning we climbed King´s Canyon along with 16 others who had joined us from another group as their bus had broken down and their guide needed to fix it! There were some great views from the top and it was a lot easier than climbing Table Mountain. Drove back to Alice Springs and on the way back Chris along with a little help from Wayne and Hank had to move a dead, pregnant cow from the road. We stayed at Melaka´s in town and caught up with some washing, that red stuff really does get everywhere! We ate at the Overlanders which had a nice atmosphere and then went for a few drinks in Bojangles where we saw some people from our Sydney- Cairns tour!